Robot Save writes a save status message for each operation it performs. These messages display on the Status and Completion Inquiry panel. For some status messages, you can override the setting that specifies whether the messages display a Warning flag on the Status and Completion Inquiry panel. The Warning flag indicates that there are warning messages for the backup. If you use Robot Network with Robot Save, you also can specify the severity code that is sent to the Robot Network Status Center for those messages. 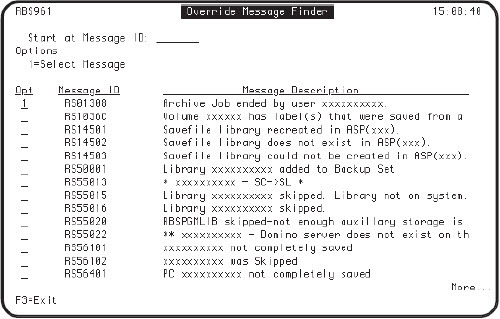 The Override Message Finder panel displays. Enter a 1 next to the message you want to add to the list. Only messages that appear on the Override Message Finder panel can be changed. 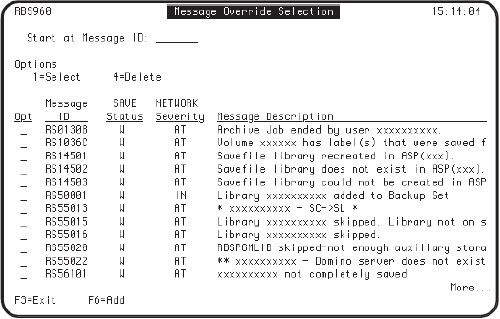 The Override Message Severity Maintenance panel displays. Enter a W in the Robot Save message severity field to have the message display a warning flag on the Status and Completion Inquiry panel. You also can specify the severity of the status that is sent to the Robot Network Status Center. Continue to follow these steps to add as many messages as you wish to the Message Override Selection panel.